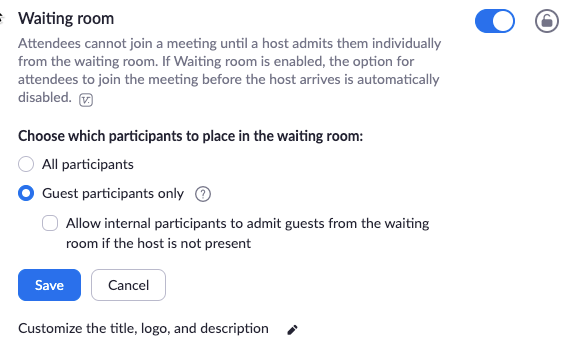 The Waiting Room feature allows the host to control when a participant joins the meeting. As the meeting host, you can admit attendees one by one or hold all attendees in the waiting room and admit them all at once. 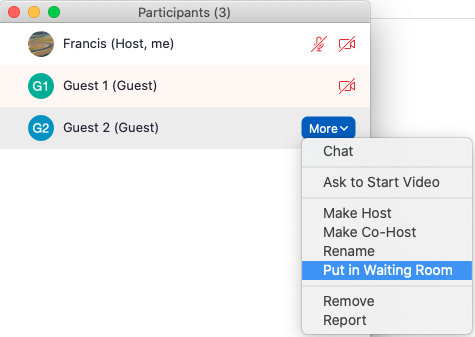 Note: If the Waiting room option is enabled, Join Before Host will not work for that meeting or meetings. 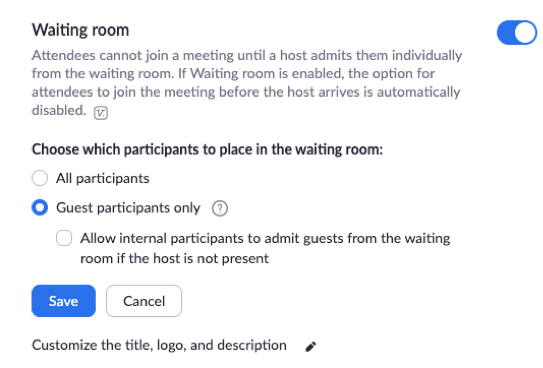 Navigate to the Waiting Room option on the Meeting tab and verify that the setting is enabled. Note: If the setting is disabled, click the Status toggle to enable it. If a verification dialog displays, choose Turn On to verify the change. Click the Group Name, then click the Settings tab. 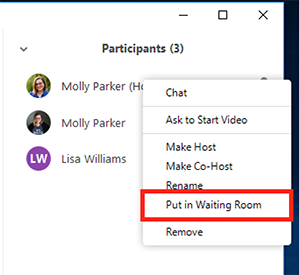 On the Meeting tab, navigate to the Waiting Room option under In-Meeting (Advanced) and verify that the setting is enabled. If the option is grayed out, it has been locked at the Account level, and needs to be changed at that level. 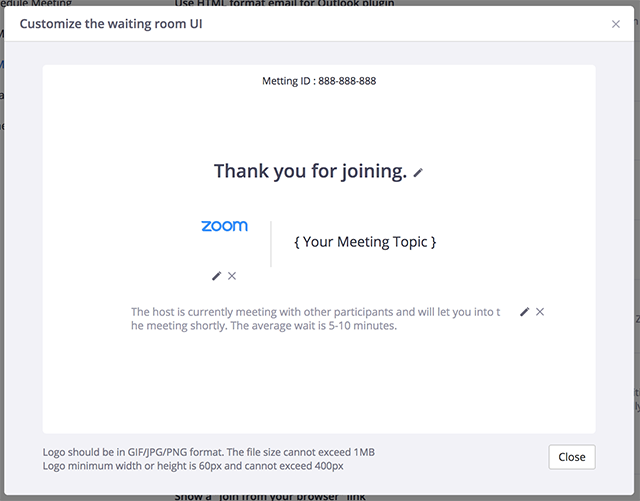 Sign into the Zoom web portal and click My Meeting Settings, if you are an account administrator OR click Meeting Settings, if you are an account member. If the option is grayed out, it has been locked at either the Group or Account level, and you will need to contact your Zoom administrator. 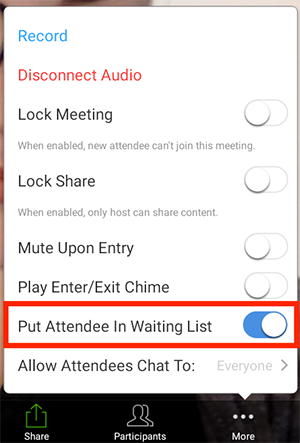 Before you can enable Waiting Room for an individual meeting, you must enable it in your meeting settings. Login to your Zoom account and navigate to My Meetings. Click a meeting topic to edit it or schedule a new meeting. Under Meeting Options, check Enable Waiting Room. Before you can enable Waiting Room for your PMI, you must enable it in your meeting settings. 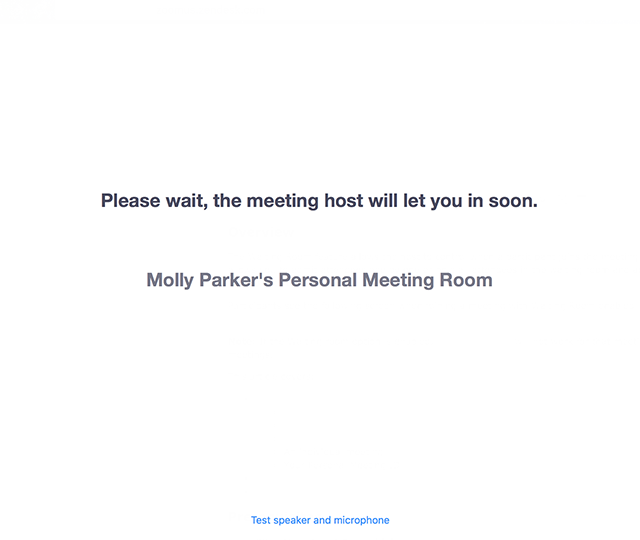 Click the Personal Meeting Room tab. 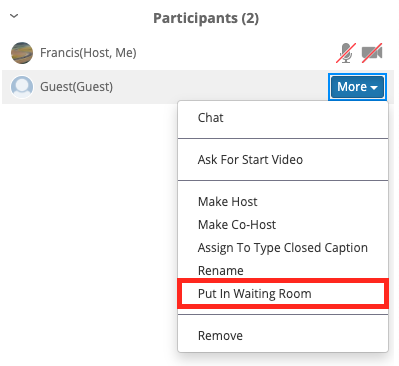 As the meeting host, click Manage Participants. 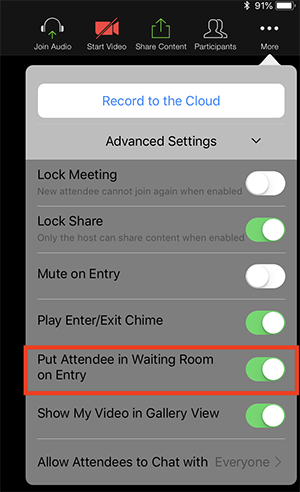 Click More at the bottom of the participants' window and choose Put Attendee in Waiting Room on Entry to enable or disable the feature. Click Admit to have the participant join the meeting. Click More next to the participant's name and choose Put in Waiting Room. Click More and choose Put Attendee in Waiting Room on Entry to enable or disable the feature. Click More next to the participant's name and choose Put on Hold. As the meeting host, tap More. Toggle Put Attendee in Waiting List to blue to enable or white to disable. As the host, tap Participants. Next to the name of the participant you want to admit, tap Admit. Tap the name of the participant you want to send to the waiting room. Tap Put in Waiting Room. Toggle Put Attendee into Waiting Room on Entry to green to enable or white to disable. Click More next to the participant's name. Click Put in Waiting Room. You can customize the waiting room title, logo, and description at an account, group, or user level. Note: You will need to enable waiting room before you have the option to customize it. 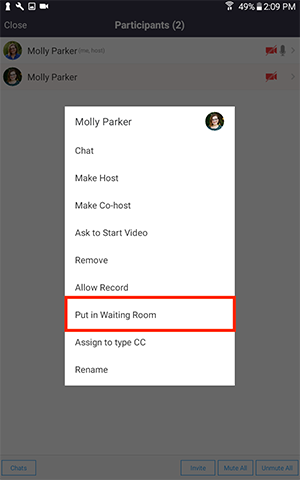 After enabling waiting room, navigate to the Waiting Room option under In Meeting(Advanced). Click the pencil icon below the Waiting Room option. This will open the waiting room customization options. Title: Click the pencil next to Please wait, the meeting host will let you in soon. to update the meeting title. Click ✓ when you are done. Note: Titles are limited to 64 characters. Logo: To upload a logo, click + in the logo box. Note: Logos can be in GIF, JPG or PNG format. They cannot exceed 1MB. The minimum height and width is 60px and the maximum is 400px. Description: Click Add waiting room description to add a description to the waiting room. Click ✓ when you are done. Note: The description is limited to 400 characters. Participants will see your custom waiting room branding when they join the webinar.